In the film industry, George Clooney is considered the equivalent of a Renaissance Man. He can act, write, and direct a film with the best of them, often taking on more than one simultaneously. Nothing seems like too much for this man to handle, that is, until he came across this Coen Brothers script. Joel and Ethan Cohen have delivered over a dozen films that tackle social complexities and mix them in with a complex tone that tends to be a hybrid of serious drama and humorous antics. On paper, the script may read one way, but only the writer(s) really know the true intentions behind the words, and that’s where Clooney was beyond his capacity. 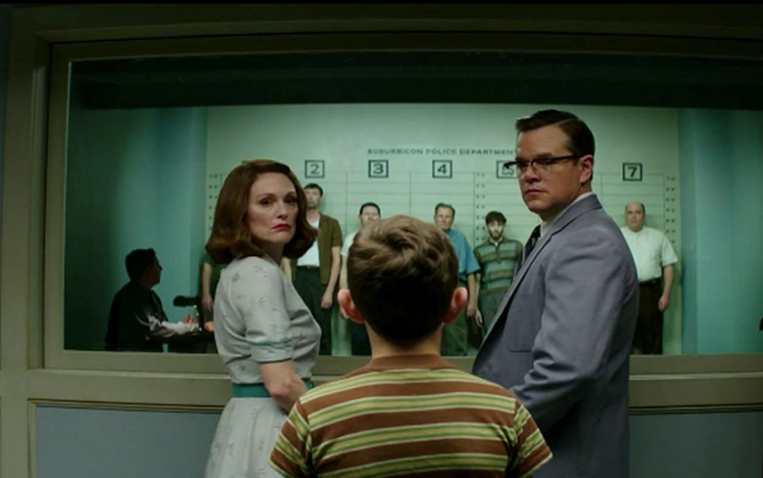 True to Cohen Brothers style, “Suburbicon” showed glimpses of a Hitchcockian suspense-thriller meant to have comedic flourishes throughout. The execution of this aspiring dark comedy, on the other hand, made sure that only the “dark” part of the film translated on screen, while the “comedy” portion received a different kind of execution, making it dead on arrival. What we ended up with was a painfully plain film that is so blunt, straightforward and bereft of nuance that it might as well be the 45th President of the United States. There’s even a metaphor throughout the film that depicts the barbaric treatment of some new residents of color in this all-white suburb, hiding behind the guise of community safety. This is meant to highlight the existing problems in the community, and how the Lodge’s (an average white, American family) are doing more harm to their community than the new family ever could.